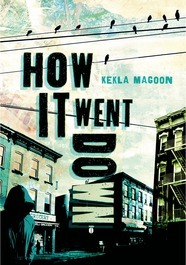 How It Went Down by Kekla Magoon. Henry Holt. 2014. Review copy. The Plot: Tariq Johnson, sixteen, dies from two gunshots fired by by Jack Franklin. Tariq is black; Jack is white. There are many people who know Tariq, who know Jack. Who saw them before the shooting and after. Each has a their own story to tell, about what they know. The Good: There is an old saying, that for every two people there are three sides to their story. Their versions, and the truth. The problem, of course, is figuring out what that truth is and is not. Here, there are those who say that Tariq was just a teen with a chocolate bar. And others who say he had a weapon. And some that say that Jack was justified. And others who say it was murder. How It Went Down is told in many voices, friends, family, acquaintances. It's the story of Tariq's life and death and the aftermath, but we also find out about the lives of those who in telling Tariq's story tell their own. What I like about these multiple narratives is it doesn't give any answers of what really happened. It's up to the reader to decide who is right -- but the thing is, it's clear that everyone is right. Or, rather, everyone believes that they are right in what they know, what they saw, and what they believed. And it's not just the shooting of Tariq, and whether or not it's the self defense that Jack claims. It's also whether, as the story unfolds, Jack's claim of self defense is made in part not because of anything that Tariq did or did not do but because Tariq was a black teenager and so Jack assumed and believed things about Tariq. And along with that is how the others react to Jack's claims, including the police who release him. And then the community reaction, because a black teenager is dead and the white shooter is released. From the start, the reader knows that Tariq is dead. Knowing that doesn't lessen the impact of this death, or feeling the sorrow and grief of his family and friends. It does make one wish "if only, if only." And while this will be a good book discussion book because it allows for the readers to say what they believe happened, it's also a good book discussion book because it allows the reader to take a closer look at their own beliefs. Who do they believe? And why? How does one's own perspective influence their memory? What they see? And what they believe?